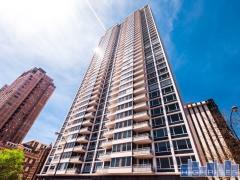 Silver Tower is a newer (2010) condo tower with sensational views from oversized balconies and windows. These homes feature stainless appliances, granite counters, marble baths, en-suite washer and dryer connections and floor-to-ceiling windows. Building amenities include a 24/7 doorstaff, fitness center, sundeck, on-site management and available garage parking. Have any comments or questions about Silver Tower? Ask your question and/or share your thoughts about this Building.